One of the nice features for biking in Minneapolis is the Midtown Greenway. This currently runs from the lakes on the west side to Hiawatha on the east and construction is underway right now to take it to the West River Road. This follows a rail line from more or less Hiawatha to the river road. I wrote about it last fall; I have actually ridden a section this summer and am happy to see the lighting in, the access ramps getting built and the base gravel layer being put down. In fact, the Greenway site says the paving is complete to Brackett Park but please stay off so the contractors can finish up. The whole Greenway works like a bike highway, great for making quick time across the city. A fire that damaged a railroad bridge over the Mississippi is affecting Minneapolis businesses that rely on trains to ship their products. Whoever launched fireworks that set fire to a railroad bridge spanning the Mississippi River in south Minneapolis may have no idea what mayhem they caused. The 1,061-foot-long bridge, also called the Short Line, carries the only railroad line that can serve several grain elevators and a scrap metal recycling business along Hiawatha Avenue. It will cost more than $200,000 to repair a hundred-yard section in the middle of the 125-year-old bridge. Because of the fire, the span won't be operational for at least a month and that could mean a $200,000 loss to Leder Brothers, which ships its recycled products throughout the United States and Canada, according to co-owner Mark Leder. At least 65 railroad cars that reached the Hiawatha businesses before the fire are stranded, and a 25-car train of grain headed for the elevators on Tuesday had to be diverted to storage elsewhere. More than 5,000 railroad cars of wheat, rye, barley and corn cross the bridge each year, said John Gohmann, president of the company that provides railroad access to the Hiawatha businesses. If the elevators have to ship grain by truck instead of train, the companies would lose about 30 percent of the dollar value of the product, he said. He said that his company, Minnesota Commercial Railroad, will lay off up to six employees until the bridge reopens. And in about five weeks, it will be prime time to move grain out and make room for new shipments, he said. The steel deck truss bridge with seven spans starts near W. River Road and E. 28th Street and crosses to E. River Road and E. 25th Street. The bridge's tracks hang 150 feet above the river. A passerby reported a fire to police shortly after midnight Saturday. Winds fanned the blaze, which took two hours to extinguish. Accidental causes have been ruled out, Minneapolis police Sgt. Sean McKenna said. He also said that fireworks were found on the bridge. Several "no trespassing" signs are posted at each end of the bridge, but police say people still climb on it. Laura Baenen, spokeswoman for Canadian Pacific Railway, said people have been cited for trespassing, but the company hasn't had previous problems involving fireworks. And "the bridge isn't a place for a hike," she said. When the bridge will be open again is unclear because of the work required to replace 250 custom-treated wooden ties. It will be done in two phases, and the first will let trains use the bridge at very slow speeds. The lack of rail access hasn't slowed two elevators owned by General Mills, said spokeswoman Kirstie Foster. Archer Daniels Midland operates two other elevators served by the railroad but said it couldn't determine the effects of the bridge fire. How much business Leder will lose depends on a fluctuating steel market, he said. Their finished product is sent out monthly, he said. "We can't make sales we have waiting in Canada and Iowa," Leder said. "This is definitely having a large impact on our business." Using trucks isn't feasible, he said. One train car carries the same amount of their product as 3½ semi trucks, he said. It's also difficult to find trucks that will only travel one way, not to mention the additional fuel costs, he said. Leder also talked about past uses of the bridge, including the delivery of a mammoth drill for a tunnel that carries light-rail cars beneath Minneapolis-St. Paul International Airport and deliveries of new light-rail cars (Metro Transit is adding three cars, but not until January). "People don't realize how important this bridge is," he said. "We will really have to scramble until it's fixed." I am gratified reading this article to see that they have plans to fix the bridge. I was afraid they might just write it off and abandon the rail line and the chances for using it for bicycles would drop significantly. Even fixed, I think there is some chance it will never serve for bikes, but it would be a terrific route if they would. Here's hoping the bridge gets fixed and the Greenway gets extended. It would be a real addition to the Cities' cycling infrastructure. Oddly enough, I happened to take a photo of the Short Line Bridge (as it's called, see this site and scroll down to Bridge 23) on Saturday morning, just hours after this fire was reported and put out. I was on my way to the Riverview Theater to watch the Tour de France (I highly recommend this!) and the upriver-bound tow and the rowing shells sharing the river caught my eye. The Short Line Bridge is the rail bridge the tow is about to go under. If you can't see the rowing shells, click on the photo to get the larger version. 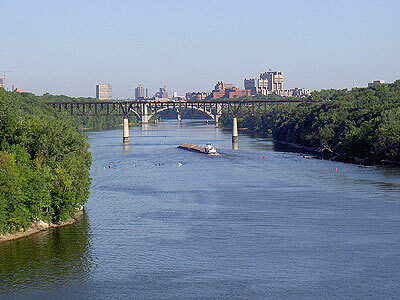 The buildings in the background are the part of the East Bank part of the University of Minnesota.